Debbie and I would like to take this time of the year, (celebrating the birth of our Lord and Savior Jesus Christ), to wish each of you a very Merry Christmas and Happy New Year. From the bottom of our hearts, we gratefully thank you for the tremendous love and support you have provide this past year. As we approach our first year anniversary as a married couple, and the church just celebrating its one year anniversary a couple months ago, I'm simply amazed at what our Lord has done in a very short time. The words of King David taken from Psalms 45:1 seem so fitting, "My heart is overflowing with a good theme; I recite my composition concerning the King; my tongue is the pen of a ready writer”. The many lives we have seen dramatically touched by the hand our Lord Jesus, the dozens of children and families which seemed hopeless living happy Godly lives, helpless souls lost in the dark drug and gang worlds drastically changed and re-created by the awesome love of Jesus, men and women coming out of prison and jails with no one to help, finding God's helping hand up, which was all many of them needed, a chance. We have seen well over 100 lives this year deeply touched and walking the walk. God is doing a revival of souls in our community and the members of our church are to be honored for their loving sacrifices. I have had dozens of people tell me they have never seen anything like the labor of love, support, help, time, energy and compassion given by a small group of kingdom labors. This is the season to be thankful, and we are so very grateful and thankful to our Lord Jesus for each of you. We are also excited about our future together; the future of the Recovery Home, the direction our church heading, "To Love God, To Love People, To Serve Both While Serving Our Community". We have enjoyed a great harvest this year, but we believe the coming year is going to be the season of a tremendous move of the Holy Spirit through the love of Jesus in our community. We love each of you deeply with the love of our Lord Jesus Christ and pray God will continue to richly bless you this Christmas Season. 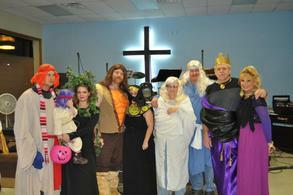 We turned Halloween into a great opportunity to teach our kids that Christianity can be fun while using it to educate them on the Biblical stories and characters. Pictured from left to right Scott Hale, Rachael and Willow Sigman told the story of Zacchaeus and Sycamore Tree. Joe and Melody Horton came as Samson and Delilah for best costume, Lynn and Sandy Parr came as Noah and His wife turning their SUV into an Ark and passed out dozens of stuffed animals, they tied with Zacchaeus for best theme, and Debbie and I came as King David and Bathsheba. We want to thank everyone for their support. What a great turnout, over 30 kids dressed up, and about that many adults. Amanda Thomas and Debbie Long provided face painting for the kids. It was a GREAT time and a huge success. 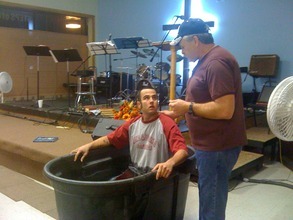 Garrison Ferguson was baptized Sunday, November 27th. Garrison is yet another success story of God’s work that’s going on in the Stephens County jail. He spent several months in F-Pod which is the pod famous for the picture of the Holy Spirit Manifestation. We have some awesome teaching seminars by Duane Sheriff Ministries that’s making a huge difference in the jails. F.L. Estes, Dave Horn, and the entire jail staff are very special people and God is using the jails to change many lives. 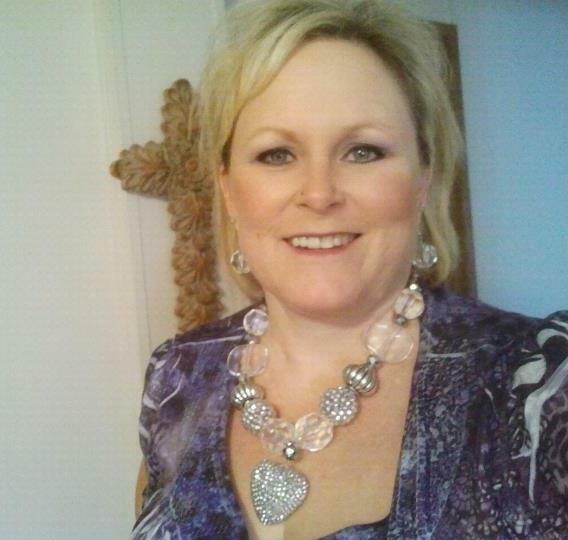 Sharon Cain of the drug court and all the Stephens county parole office are to be commended. These folks are very professional and they do truly care about the lives of their people. They are so overwhelmed at times that we can feel their exhaustion, but they continue in this difficult work of putting lives back together and changing our community one life at a time. In closing, we would like to honor all our fellow laborers, space does not allow us to mention all your names, but you know who you are. May the Lord richly bless you this season and increase your much needed tribe. This month we are going to feature two of them. LaCrecia and Sandy have joined our Chaplaincy team and they are a tremendous blessing to the men and women in jail. 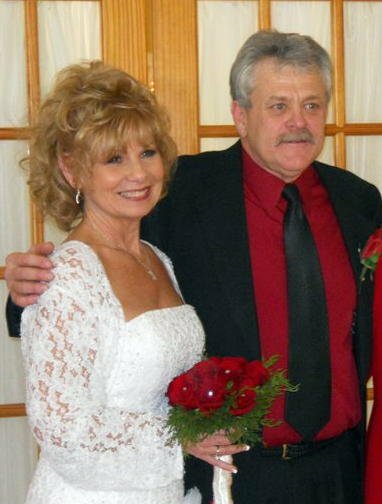 The greatest Christmas gift given to Debbie and I this season, was the complete healing of our dear mother from bone cancer. The Lord Jesus has totally healed mother…Thank you Jesus for this early Christmas miracle! Remember Jesus is the reason for the season! “Give thanks to the LORD, for he is good. His love endures forever. Give thanks to the God of heaven. His love endures forever.”Psalm 136:1,26 NIV.Remember it takes years for us to grow to adulthood, and it takes a full season for fruit to mature and ripen. The same is true for the fruit of the Spirit. The development of Christlike character cannot be rushed. Spiritual growth, like physical growth, takes time. While we worry about how fast we grow, God is concerned about how strong we grow. God views our lives from and for eternity, so He is never in a hurry.– It takes time – there are no shortcuts to maturity. Remember how patient God is with you, then go do the same. The world shall know you are Mine, by the love you have for one another! Tuesday at 7 PM- Sunday at 10:30 AM & 6 PM: Regular Church Services. Come feel the Love of Jesus and be refreshed and encouraged. Wed.! 7 PM: Ladies Night Out. 12 Step Life Recovery Bible/Workbook/ Small Groups. The ladies are building loving relationships as they share personal testimonies pertaining to the lesson. It’s very powerful learning to be free in a loving and trusting environment. Thur.! 7 PM: Men's Night Out. 12 Step Life Recovery Bible/Workbook/ Small Groups. The men’s group is working primarily the same as the ladies. Sat.! 7 PM:! 12 Step Life Recovery Bible/Workbook/ Small Groups. Joe and Melody Horton are doing a great job. They are excited as we all learn the ways of the Lord together while journeying in the steps of Jesus experiencing the abundant life He promised, it’s called FREEDOM! Amanda Thomas and Melinda Lara will phase up this month in drug court. Congratulations! Sunday Morning at 9:30 AM come join Dwain and Arvel Adkins as they Discussand Explore the Bible together. This month Numbers and Deuteronomy: Life on the Edge! If you would like to become a partner in this ministry, please fill out the form below, clip it off and mail it to our new church, The Recovery Church. Please make out support checks in the name of The Recovery Church, P.O. Box 2117, Duncan, OK 73534 in order for them to be tax-deductible. ( ) I will be in earnest prayer for this ministry. ( ) I commit $_______as a one-time offering. Love God, Love People, Serve Both While Serving Our Community!